The Summer holidays are looming! Yes, we’ve already got the sunshine in the UK (at long last!) but perhaps you are planning a holiday abroad? Or, if you’ve got a trip planned a little closer to home, I hope the weather continues to be as gorgeous as it is now! I don’t know about you, but I’m a list writing fan – I write lists for everything…work, blogging, shopping, party planning, housework…and of course a holiday packing list! 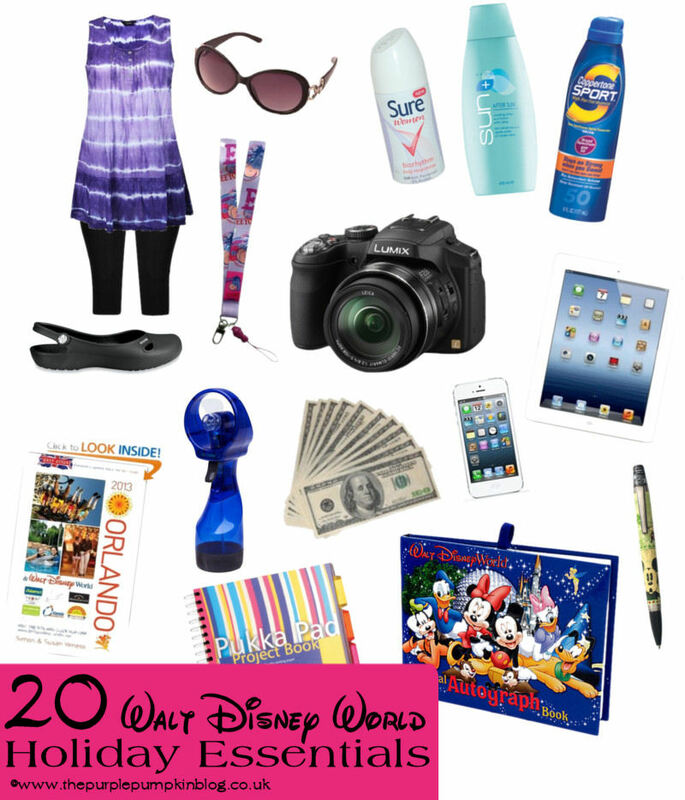 I was asked to think about the essentials I would take on holiday with me, and since we are off to Orlando and Walt Disney World this summer, this got me thinking! Just putting my list together has made me so excited to be going back to the magic, and I’m so glad we’ve had this booked for a while now – I…we…all really need a break away! If you haven’t planned a holiday yet, it’s not too late to book! Why not check out some holiday deals online with icelolly.com and see if you can get yourself a bargain? I’ve made a collage of some of the things that I believe to be Walt Disney World, Orlando Holiday Essentials, and you can read through my list just below. I’ve added a few more things, not pictured too. Holiday Guidebook – if you are planning a trip to the magic, no doubt you’ve picked up a guide book somewhere along the way to help you. I always take mine with – just in case I can’t get on the internet I can still check things out with my handy dandy guidebook! Your Holiday Planner – if you have made a plan before you’ve gotten on that big metal bird, don’t forget to download and print my FREE Printable Walt Disney World Planner! Clothes that keep you cool – shorts or cropped trousers/leggings and sleeveless tops are my essentials. Florida, especially in August, is hot, hot HOT! Comfortable shoes – my personal choice of shoe for walking around theme parks all day are comfy Crocs. Yours might be trainers, sandals or flip flops. Whatever your choice, make sure they are well worn in, you don’t want sore feet and blisters to ruin your holibobs! Sunglasses + Hat – it is bright in Florida with all the sunshine – it isn’t called The Sunshine State for nothing! You want something to protect your eyes and something to protect your head. I wore head scarves rather than a hat/cap the last time we went. Anti-perspirant – you don’t want to stink after all that walking around all day! Pop a small deodorant into your bag so you can freshen up if you need to! Suncream + Aftersun – we all know the dangers of the sun. (I’ve managed to get a little burned just from walking out and about the last few days here in the UK), so please slap on some suncream. We use a spray one which is easy to apply frequently when walking around all day. And, to help the tan (or protect the burn if you should catch too much sun) some aftersun. Dollars – the exchange rate at the moment isn’t too favourable, but don’t forget to convert your cash while you are here in the UK. I hear that you get even worse rates if you convert pounds into dollars in the USA. If you can get some change at the airport when you land, and are driving yourself to your accommodation, all the better – you will possibly need that for the tolls. Theme Park Tickets – I recommend buying your tickets before you go. A little research on the net will give you several good vendors and they often have special deals going on. We got a free swamp airboat ride with our tickets this year! Keep them safe and take a scan/photo of the numbers on them, should they go astray – that way you can get them replaced if needs be. Lanyard – to keep those tickets safe and within reach all day, why not purchase a lanyard with a pouch to keep them in. They’re a few quid online and they’re also great for attaching your pin collection to. Camera/Camcorder/Camera phone – you will want to capture the memories of your holiday – a kiss from Mickey Mouse, a jump into the swimming pool, a parade, the smiles on your faces! Don’t feel like you have to take a huge expensive camera with you, if you don’t have on. I actually took the majority of our last Florida holiday photos with my iPhone4! Saving my ‘big’ camera for things like the fireworks and our Serengeti Safari Tour at Busch Gardens. You might want to buy a couple of disposable waterproof cameras for the waterparks or round the pool, if you don’t have a waterproof camera (or case) already. iPad/iPhone/Tablet/Smartphone/Laptop/Notebook – Disney parks & resorts now have WiFi, and there is every chance your offsite accommodation will have some sort of internet access too. Keep in touch with each other (there are apps out there that you can send free messages with) in the parks if you get split up, get online if you need to, or find out where the nearest restaurant is. I love the internet and couldn’t be without some sort of access! We used to transfer all our photos from the camera each day onto our Notebook – just in case something happened to the camera! Autograph Book + Chunky Pen – if you have children they may well want to meet the characters! You might even want to do that even if you don’t have kids (We did in Disneyland Paris, I have no shame! ), and it’s cool to collect autographs! You can make your own autograph book or buy one ready-made. A big chunky pen or marker is ideal for the characters to hold! Notepad – If you are a long time reader of my blog, you’ll know that I love to write trip reports, and I can’t do that without making some notes along the way! I like to think that my trip reports are handy for first-time visitors to Florida, or give insights and share photographs of our experience to various destinations that we’ve been to. And so, I take a notepad and some pens with me to keep a diary at the end of each day. I’m a long life diary keeper, so this isn’t a hassle for me, but if you do want to try your hand a writing a trip report – do it! It’s so lovely to read back over them years later! My husband kept his own diary with an app on his phone. Poncho – whilst you get lots of heat and sunshine in Florida, you will also experience a few showers (okay, sometimes downpours) of rain – it is a tropical climate there after all! And to be able to throw a poncho over yourself to stop yourself getting wet is a good thing! Although you will dry off again quickly. Unless of course you get the torrential rain we did at Magic Kingdom, where we got soaked through, despite the ponchos! They’re also handy for the water rides. Small Backpack – to keep your stuff in throughout the day. Plastic Bag/s – to pop your camera/valuables into to protect them on water rides. Prescription Drugs – if you have to take regular medication, don’t forget these. And, take a copy of your prescription with you – just in case you have to get it filled while you are on holiday. A trip to Walt Disney World is a magical holiday…so finally, don’t forget to bring the kid in you! I LOVE Disney, so your link caught my eye right away at the Tuesday Trivia link party. ;) Great list! ;) ENJOY your upcoming trip!! Would love to have you stop by and visit me at ChattingOverChocolate.com sometime. I kick off each week with a”Magical Monday” post dedicated to all things Disney! Thanks for stopping by Brenda! We can’t wait for our trip – so excited! Glad to have found another Disney type blog to drool over!! I’ve got so many posts lined up relating to Disney, just haven’t gotten around to posting them – eek! Enjoy your trip! I’d love to go at that time of year – especially for Halloween!!! fab fab fab… more great tips and ideas for our trip to Disney in Oct!! thank you! Happy to help! Got a few more posts up my sleeve which I hope you’ll find useful too!